My native plants gardening page . 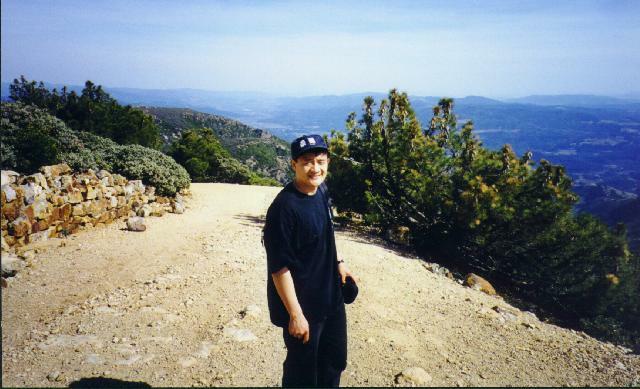 Please go to my travel pictures page for some photos taken in different parts of the world on my vacations. Mount Emerson via the 5.4 Southeast Face route (13204ft./4025m, 1 day), completing another Sierra classic, with Mike Chen (Photos only). Mount Illimani (21,126ft./6439m) attempt, unsuccessful first foray with Mike Chen into the high Andes Mountains of Bolivia, South America. Matthes Crest via the 5.7 Ridge Traverse (South end to the North Summit, 10919ft./3328m, 1 day), completing my second long trad lead on this fantastic, otherworldly peak, with Mike Chen (Photos only). Mount Conness via the 5.6 North Ridge route (12590ft./3837m, 1 day), completing my first long trad lead on this beautiful peak despite a thunderstorm, with Mike Chen (Photos only). Mount Darwin via the class 3 West Ridge route and a 5.7 summit block (13831ft./4216m, 3 days) in austere back country of Kings Canyon National Park, with Hakan Yalcin, Vladimir Ulyashin, and Mike Chen (Photos only). Mount Shasta via the Avalanche Gulch (14162ft./4318m, 2 days) An arduous training climb with miserable winds and an awesome snow descent, with Mike Chen (Photos only). Mount Whitney and Mount Muir via the Mountaineer's Route (14495ft./4418m, 3 days) in icy late fall conditions. 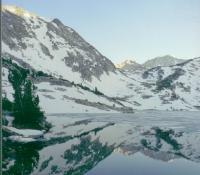 Mount Muir is my 11th 14er, with Mike Chen (Photos only). Attempting Mount Clarence King and Climbing Fin Dome (11693ft./3564m, 3 days) An arduous trip to the remote valleys in Kings Canyon National Park, with Vladimir Ulyashin and Mike Chen (Photos only). Mount Sill via the atrocious Elinore Lake approach followed by the class 4 North Face Gully (14153ft./4315m, 4 days), plus another day climbing Palisade Crest via Scimitar Pass. My 10th 14er, with Mike Chen (Photos only). Cathedral Peak, Cockscomb, and Unicorn (10910ft./3325m, 2 days), moderate roped climbing on elegant class 4 granite, with Mike Chen (Photos only). Mont Blanc ascent (15781ft./4810m, 2 days) Conquering the highest peak of European Alps, with Mike Chen. This was also my most difficult glacier climb to date. Mount Ritter via the Southeast Glacier route (13143ft./4006m, 4 days) Practicing glacier climbing and almost made it to the top, with Mike Chen (Photos only). Attempting Mount Triumph and Climbing North Early Winter Spire (7760ft./2365m, 3 days) A taste of the awesome yet unforgiving North Cascades National Park, with Dirk Summers (Photos only). Mount Starr King via a 5.2 route (9092ft./2771m, 2 days), with Hakan Yalcin, Vladimir Ulyashin, and Erhan (Photos only). Capitol Peak via the Northwest Buttress (14130ft./4307m, 3 days) A scary rock climb in the Colorado Rockies. My 9th 14er, with Dirk Summers. Mount Humphreys via the standard route (13986ft./4263m, 3 days) Conquering this gigantic hulk of a mountain in a remote desolate zone, with Hakan Yalcin (Photos only). Bear Creek Spire via its northeast ridge (13720ft./4182m, 2 days) A beautiful mellow climb on a gorgeous peak in a blustery day, with Mark Thomas (Photos only). Mount Williamson Attempt (14375ft./4382m, 3 days) The most arduous climbing trip I have attempted in California, with Hakan Yalcin, Vladimir Ulyashin and Cenk Caliskan. North Palisade Climbing Trip ( North Palisade - 14242ft./4341m, Starlight Peak - 14200ft./4328m, 4 days) The second trip I organized that involved class 4-5 roped climbing, and where I successfully summitted two 14ers (my 7th and 8th). These are the highest peaks in Kings Canyon National Park, 4th and 5th highest peaks in California, and the 4th and 5th peaks over 4300m that I've summited. With Vladimir Ulyashin and Hakan Yalcin. Clyde Minaret via the Southeast Face (12281ft./3743m, 3 days) my 4th North American Classic climb, with Dirk Summers (Under construction!). Mount Lyell and Mount Maclure (Lyell: 13114ft./3997m; Maclure: 12960ft./3950m, 3 days) Attaining the highest peaks in Yosemite National Park (and my 2nd attempt at Mount Lyell), with Samantha Olson, Dave Kiene, and Rob (Under construction!). Clyde Minaret via the "Rock Route" (12281ft./3743m, 3 days) A beautiful spire with many challenges, with Samantha Olson (Under construction!). Grand Teton via the Direct Exum Ridge (13770ft./4197m, 3 days) my 3rd North American Classic climb, with Dirk Summers. 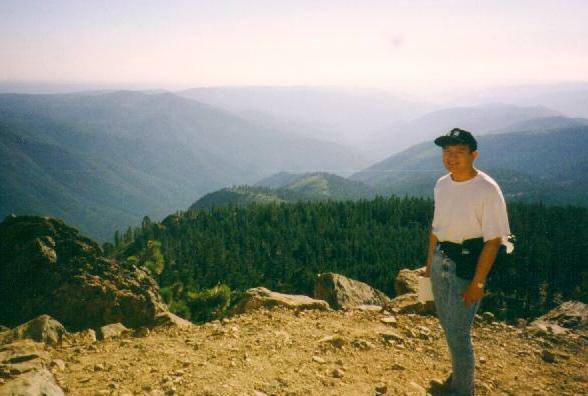 Palisades Climbing Trip (youtube video, Thunderbolt Peak - 14003ft./4268m, Polemonium Peak - 14080ft./4292m, 4 days) The first trip I organized that involved class 4-5 roped climbing, and the first trip where I successfully summitted two 14ers (my 5th and 6th). With Samantha Olson, Vladimir Ulyashin, and Hakan Yalcin (Under construction! Video by Vladimir). Mount Goethe via its northeast ridge (13264ft./4043m, 2 days) A long snow climb, with Samantha Olson (Under construction!). Mount Russell via the Fishhook Arete (14088ft./4294m, 3 days) My 4th 14,000 feet peak in California, with Dirk Summers (Under construction!). Attempting Mount Taibaishan (12360ft./3767m, 2 days) during my trip to China. Climbing Mount Shasta (14162ft./4317m, 2 days) A mammoth climb and my 3rd 14,000 feet peak in California., with Eszter Tompos and others. Climbing Mount Kilimanjaro and Mount Kenya (Kilimanjaro: 19340ft./5895m, 5 days; Mt. Kenya: 17058ft./5199m, 7 days), Africa's first and second highest mountains, with Dirk Summers. Royal Arches (1 day) My longest technical climb on spectacular walls of Yosemite Valley and my 2nd North American Classic climb, with Dirk Summers. Mount Ritter (13143ft./4006m, 3 days) A close call while attempting one of the most beautiful Sierra peaks, with Hakan and Ayla Yalcin. Half Dome via the "Snake Dike" (8842ft./2695m, 1 day) On Yosemite Valley's most famous rock formation, with Dirk Summers. Vogelsang Peak (11493ft./3503m, 2 days) Almost stranded in a big snow storm, with Hakan and Ayla Yalcin. Mount Whitney via its East Face (14497ft./4418m, 3 days) Attaining the highest summit of the continental United States and completing my first North American Classic climb, with Dirk Summers. 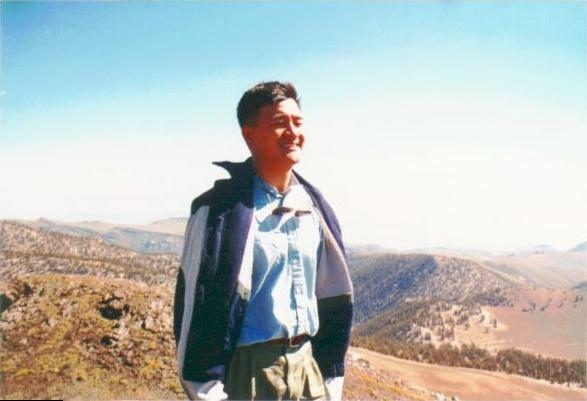 This is also my 2nd 14,000 feet peak in California. Matthes Crest (10918ft./3328m, 1 day) Climbing an amazing knife edge, with Dirk Summers. Matterhorn Peak via its Norte Arete (12279ft./3742m, 3 days) My first multi-pitch technical climb, with Dirk Summers and Mark Thomas. Mount Sill (14153ft./4314m, 3 days) A second attempt of this elusive peak, with Vladimir Ulyashin. Bear Creek Spire (13720ft./4182m, 3 days) My first successful climb of a class 4 peak, with Vladimir Ulyashin. Cathedral Peak (10911ft./3326m, 1 day) An taste of this fantastic soaring spire, with Vladimir Ulyashin. University Peak (13632ft./4155m, 1 day) A mammoth day hike to the namesake of my favorite university, with Vladimir Ulyashin. Mount Agassiz (13893ft./4234m) Two trips attempting the most alpine mountains in Sierra Nevada, with Vladimir Ulyashin. Mount Whitney attempt (14497ft./4418m, 3 days) An epic attempt at the highest peak of continental United States, with Vladimir Ulyashin. 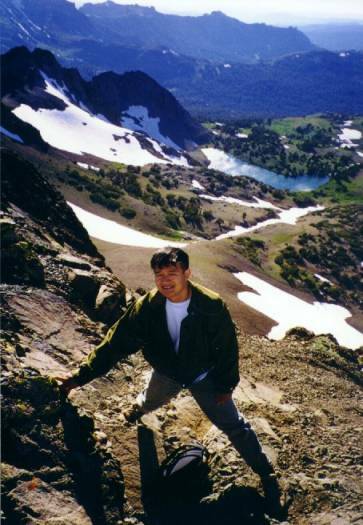 Mount Lyell (13114ft./3997m, 3 days) An arduous tour to the heart of Yosemite mountains, with Vladimir Ulyashin. Middle Palisade (14012ft./4271m, 3 days) My first summit over 14,000 feet, with Vladimir Ulyashin. Hiking in Brazil on my first trip to Brazil. Mount Abbot (13704ft./4177m, 3 days) Climbing snow couloir and class 3 rock, with Vladimir Ulyashin. Kuna Peak (13002ft./3963m, 2 days) Late fall trek to a remote peak, with Vladimir Ulyashin. Matterhorn Peak (12279ft./3742m, 2 days) Successfully climbing the peak made famous by Jack Kerouac's book Dharma Bums, with Vladimir Ulyashin. Mount Dade (13600ft./4145m, 3 days) My most harrowing peak climbing attempt, with Shubo Dai. Madera Peak environs (3 days) My first backpacking trip, with Shubo Dai. Mount Conness (12590ft./3837m, 1 day) The first major peak I summitted, with Shubo Dai. 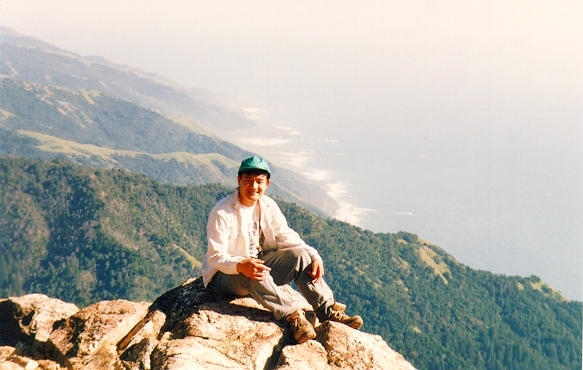 I have done a lot of day-hikes in California mountains, some of the best photos are in my picture album. 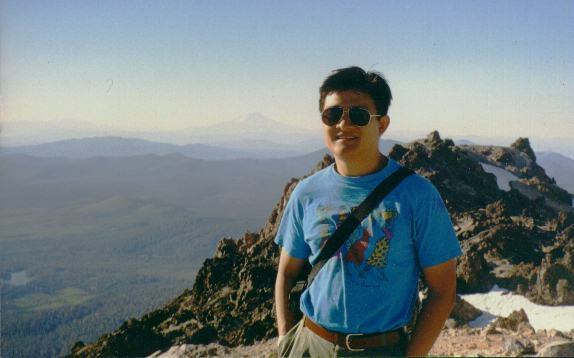 Other peaks I have summitted: Round Top (10380ft), Sierra Buttes (8591ft) in Sierra Nevada; Sheep Mountain (12497ft) and Campito Mountain (11543ft) in White Mountains; Lassen Peak (10457ft) in Cascade Range; Cone Peak (5155ft) in Santa Lucia Range; locally (San Francisco Bay Area) I often hike up Mount St. Helena (4343ft), Mount Diablo's North Peak (3557ft), Montara Mountain's North Peak (1898ft), Mount Tamalpais (2571ft). 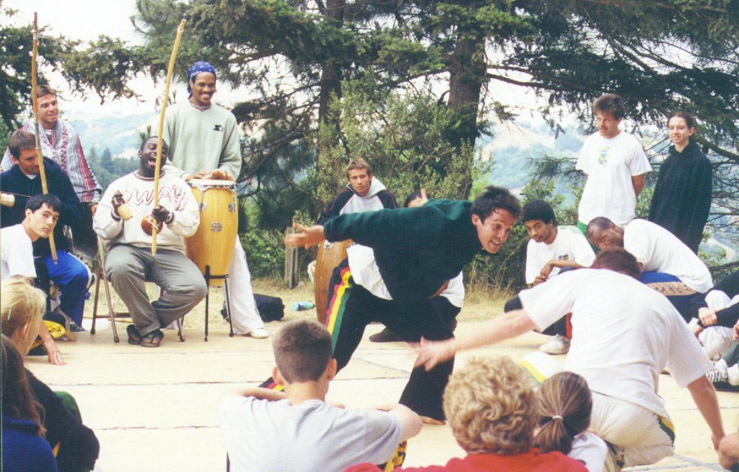 I started taking a capoeira class at Capoeira Mandinga school in Berkeley, CA in summer 1999. 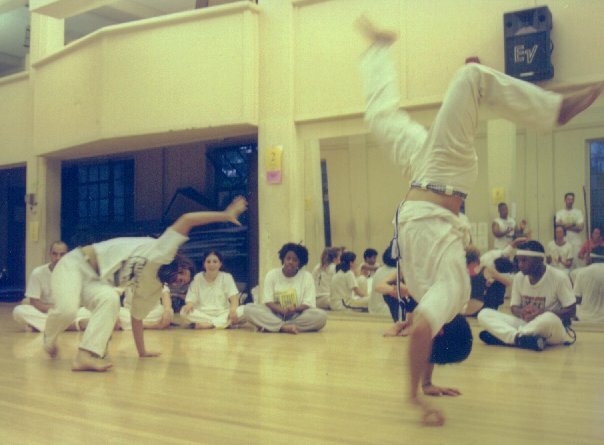 Capoeira (ka-poo-Eh-ra) is a Brazilian martial art / dance originated from African slaves. 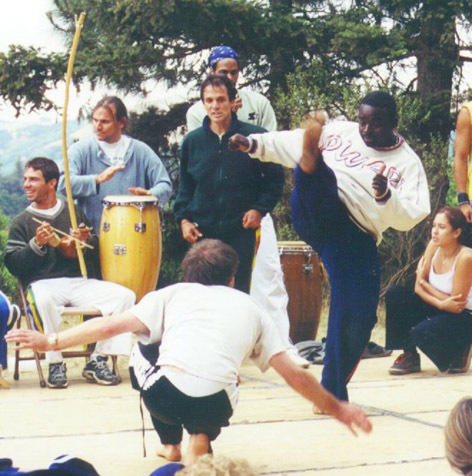 My teacher is Mestre Marcelo Pereira from Sï¿½o Paulo, Brazil. 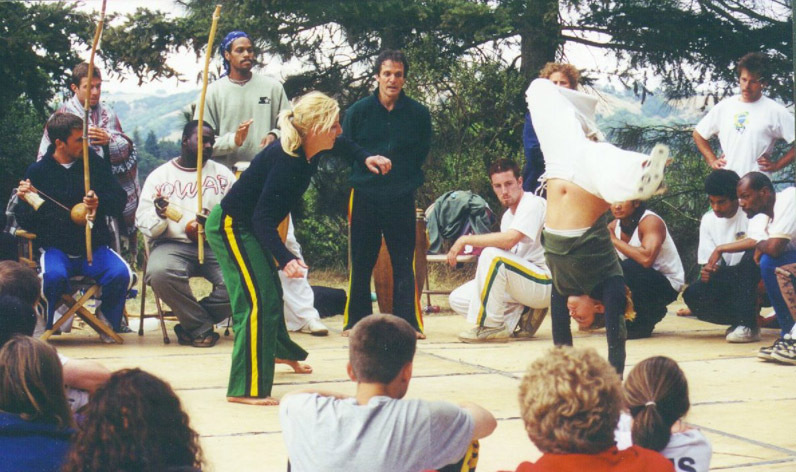 I received my green belt from our batizado (baptizing) event on June 23rd, 2001. The green belt is the first belt for beginners. 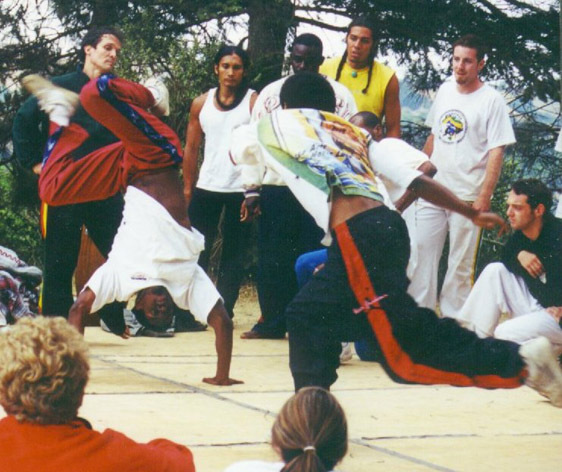 Numerous capoeira masters from Brazil showed off their amazing skills in this event. 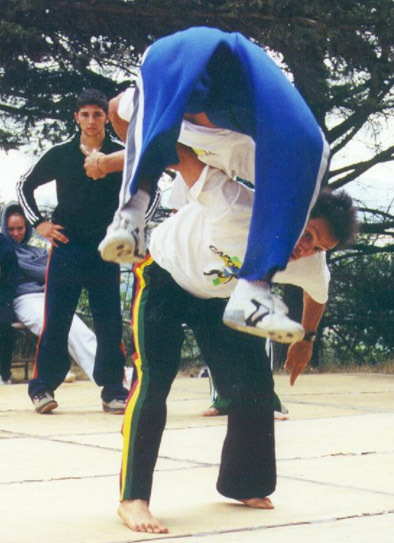 I played against Professor Gafazinho during the batizado, he didn't take me down (Thanks, Gafa!). 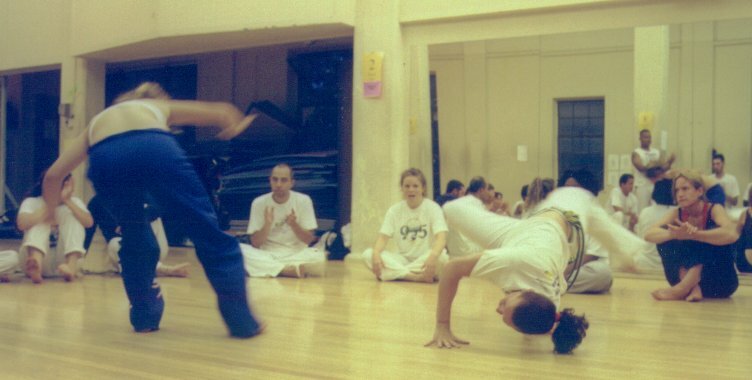 I took capoeira classes in Salvador, Bahia during my July 2001 trip to Brazil. 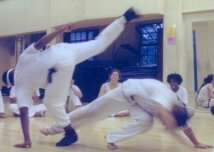 I experienced both Regional and Angola styles of capoeira. 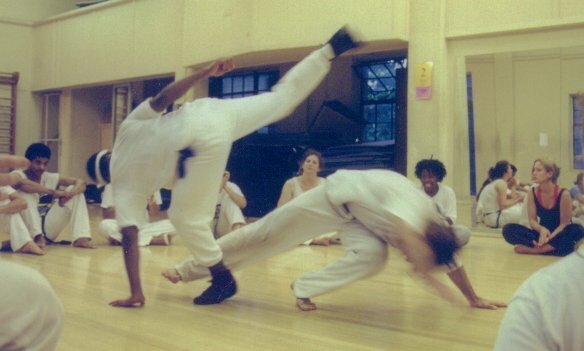 My capoeira class in action: class-mate Escovinha's capoeira movies. 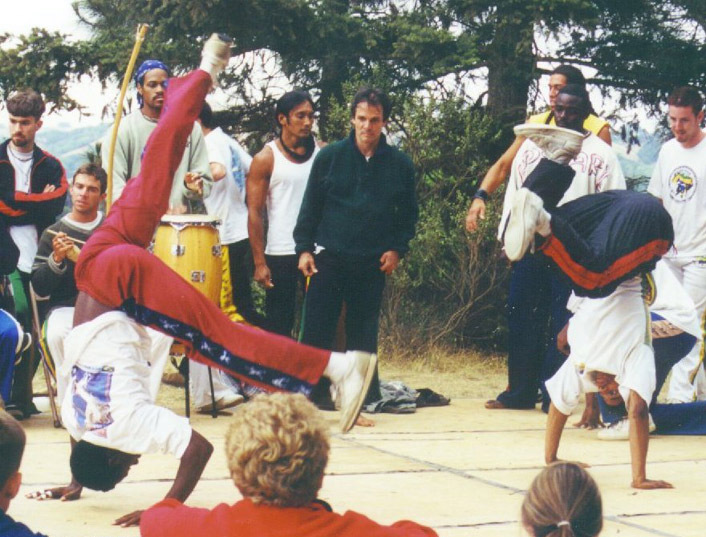 I participated in Mandinga Camp 2000 on the weekend of July 14-17, 2000 at Camp Tamarancho near Fairfax, CA. 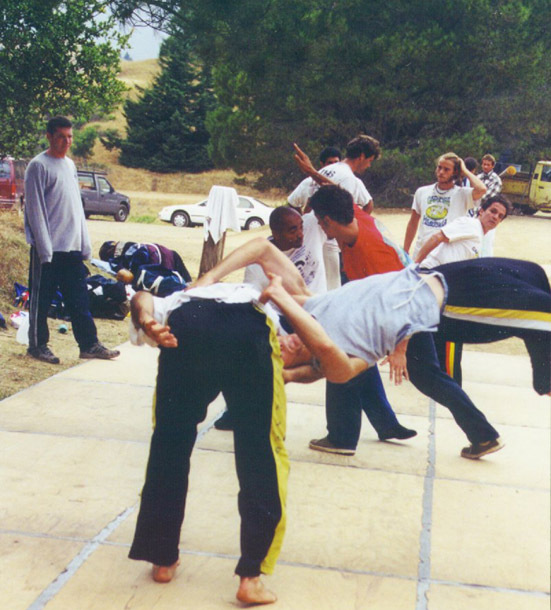 Here are pictures of the training class and roda on Sunday afternoon, as well as pictures from the Tuesday / Thursday class at UC Berkeley during Summer 2000.